First, I want to say thank you for all of your love and support on Monday. I know a lot of you were following my sister's Instagram updates and I truely appreciate all the healthy vibes you sent. They worked! Things progressed beautifully at first. I was at the hospital by 6am, started the antibiotics by 7am and was checked for the first time at 8:45am. I had already progressed to 7cm on my own, so my OB decided to wait until 10am to start the pitocin and 11am to break my water so that I could get a full 4 hours of antibiotics to treat the GBS. She advised me to get the epidural soon after starting the pitocin as well, just in case things progressed faster that what we expected. Around 11:30am my BP started going crazy. It kept dropping significantly (I had gestational hypertension going in too, so it started really high) and it stayed in the double digits on the top and bottom the entire time. It made me feel TERRIBLE. I was light-headed, dizzy, my arms and hands were tingling. And every time I tried sitting up it would drop again. I spent a lot of time getting fluids and slowly trying to raise my bed so that I could sit up. It finally worked and by 1:15pm, I had progressed to 10cm and was 100% effaced and was ready to start pushing. I remember thinking "whoa, this is going so fast!" After I started pushing for a bit, baby girl would not come down. She was transverse and her shoulder was stuck. My OB decided to wait and let her labor down a bit on her own so that I didn't spend hours pushing. I completely agreed. At 2pm we tried pushing again. No dice. Homegirl was not having it. By 2:30, we decided to wait a little longer while I laid on my side trying to get her to turn. At that point my epi stopped working and I was feeling EVERYTHING. They were able to give me a bolus at 4pm, but from 2:30-4pm I basically thought I might die from the pain. I just wanted to push and I couldn't because she was stuck so all I could do was lay on my side and breath/scream/cry through the contractions. It was awful. Once I got the bolus, it took about 10 minutes for it to take affect. When I finally got a chance to look at the clock, I knew that my OB would not be delivering my baby (she was off the clock at 5pm and I knew she had somewhere to go. We just didn't think there was even a chance that I'd still be laboring at that point.) She came in to see me and I started to cry. I was just so frustrated and we both thought that it would have gone much smoother/faster than this. I mean, this was baby #4. Everyone did. But there was just no rushing my baby girl. My OB and I talked about her size and she was confident that I could deliver vaginally, but I asked her at what point we'd decide that was no longer an option. Honestly, I was absolutely exhausted at that point and I was doubting if (1) she would ever turn and drop and (2) if I had the energy to push any longer. Together, we came up with a plan. They let me rest from 4-5pm, which I appreciated so much. I had a real moment here because I finally accepted the fact that I was no longer running the show. Baby girl was the boss from here on out and I was okay with whatever we had to do to get her here safely. From 5-6pm we did some practice side pushes to try to get her to turn/drop and get her shoulder unstuck then I rested again and labored down until 6:45pm. Around that time, I finally started feeling differently. Like MAYBE there was a chance to deliver this baby girl. And soon. The OB on call came in (she delivered my niece Aubrey so we knew she was awesome) and she was. She was simply amazing. She made me feel like I could deliver this baby girl without having a c-section. I started pushing again at 7pm and I FINALLY felt like we were making progress. All day I felt like I was pushing for no reason, but this time was the real deal. Baby girl was finally ready. After just 17 minutes of pushing, Emerson Mae came into the world kicking and screaming. 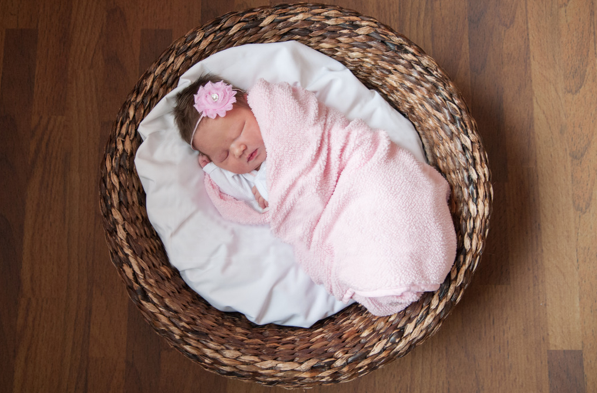 She was born on January 27, 2014 at 7:17pm weighing 9lbs 15.22oz and 21in. (No wonder she was stuck!) She has a full head of DARK (what??) hair and is absolutely beautiful! She looks like a mix between her 2 brothers right now and it is so sweet. And, let me tell ya, watching my FOUR babies meet for the first time is a moment that I will never, ever forget. My heart bursts with joy. I'll be posting L&D pictures as soon as I can, but wanted to quickly share her hospital picture that was taken yesterday at not even 24 hours old. We are so in love! Our hearts are so full and our family is finally complete. Welcome to the world, sweet Emerson Mae, we've been waiting for you. I love following your beautiful family! Congrats to the new mama of 4 and family of 6!! <3 <3 <3 She is pure perfection!! Thank you for sharing your story! I was just telling my husband last night that seeing Miss Emmie; and hearing your story, REALLY makes me yearn for just one more ;-) Congratulations mama!! so o beautiful! Made me teary! Congrats! That's amazing you did without a c-section. She's so cute! She is absolutely breath taking. Wonderful job, Jenni. Congratulations. Sorry it was a rough go for awhile bit man, what an awesome gift you got in the end! She is beautiful! Congrats mama! Every birth is so different, isn't it? She is gorgeous, and so big, you are amazing! Welcome to the world, baby girl. I'm glad you finally decided to come out! So sweet!! Love her name too :) Congrats!! Wow! She just wanted to make sure you got to experience a whole lot of labor for your last one! She' beautiful and that sounds wonderful. I'm sorry "your" OB didn't get to deliver her -- birth is so emotional and I know that was really important to me since I loved my doctor so much. Obviously it's just important that she's healthy though. And cute to boot! Congrats on your family of 6!! Not sure how you do it because I'm going a little crazy with 4 (total, that is -- just two kids). Congrats!!! So excited for you guys to be onto the next step in this amazing adventure, I do not know how you do it! Ahh congratulations, she is so sweet. haha jenni, I can't help but think of your other post and laugh "you'll have a baby by lunch time!" haha they need to make that one of those memes. you'll have a baby by lunch, they said. it'll be fun, they said. Jenni, I came across your blog a few weeks ago when googling "team green" and whether it was a good idea. I have a stepdaughter, daughter and a son and am 18 weeks pregnant. I loved your "team green" post so much that I went back to the beginning and read EVERY SINGLE post!! I love your blog!! You are a great writer. Congrats on your new baby girl!! Can't wait until you post another post, hopefully soon? She is such a doll! Congratulations! Having a baby is absolutely the best feeling in the world. I'll try to find time to read your posts which I think will be very interesting with the addition of this little darling. Thank you for sharing!